For the Birds Radio Program: Fly Up and Tell 'Em You're from Duluth! In the last few years banners and bumperstickers have been cropping up all over town proclaiming, “Duluth–and proud of it,” and “Stand up and tell’em you’re from Duluth.” But to a birder, a lot of Duluthians look like homesick southerners. Why else would there be so many flamingoes and cardinals ornamenting lawns? A real flamingo on a lawn would feel out of its element even in the deep South, unless the yard doubled as a shrimp farm. Cardinal lawn ornaments aren’t quite so bad–but they do imply that the owner wishes he were further south. I can’t understand why proud Duluthians don’t decorate their lawns with native birds–our Scarlet Tanager is a much more vivid red than the cardinal, and our Great Blue Heron is at least as striking as a flamingo. And how about Blue Jays and hummingbirds and orioles and Blackburnian Warblers? Any of them would be proud to fly up and tell ‘em they were from Duluth. A lot of people decorate their homes and businesses with pictures of owls. The Hardees on London Road has an impressive Great Gray Owl portrait–this owl is a unique enticement of the northland which people stuck in the Twin Cities and Chicago can only dream about. But most of the owl pictures I see around here are of screech owls. Now they are a cute bird, but they’re not found in Duluth. And anyway, if what you want is cuteness, a Saw-whet Owl can draw circles around a screech owl any day–and Saw-whets are one of our very own native birds. A current fad in Duluth is to stick Common Loon windsocks in front yards. 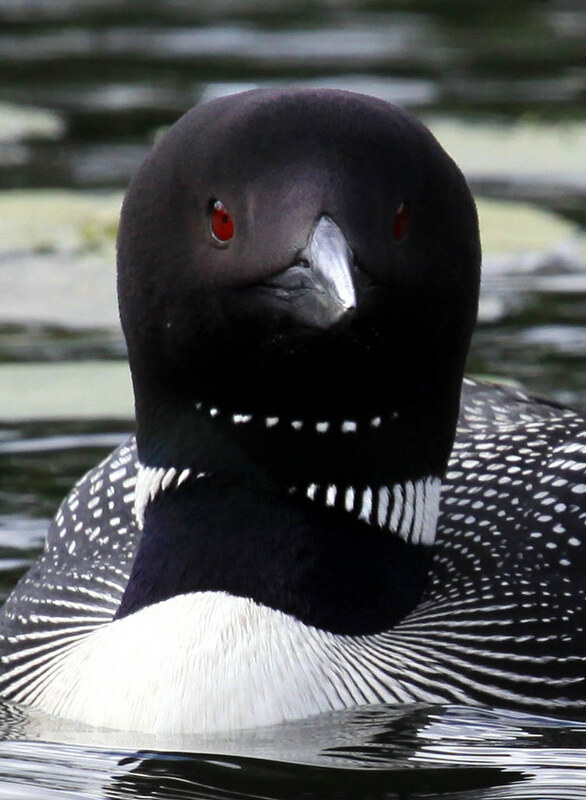 People pay good money to buy realisic-looking replicas of our state bird without realizing that loons are incapable of walking on solid ground. Their name comes from a Scandinavian word, “Lom” which means crippled. The legs on a loon are set extremely far back on the body, to make the bird more streamlined for swimming and to place the legs in the ideal position for kicking underwater–a useful skill in a state of 15,000 lakes. But the price of this watery advantage is abandoning all but water and sky. Loons are often grounded on large parking lots after a rain, when the glaring lights on wet pavement make a watery sheen. But grounded loons cannot take off again, and flail about helplessly until they die or someone rescues them. If a real loon saw one of those windsocks, it would feel nothing but pity for a fallen comrade. The best yard decoration for a real bird lover can’t be bought in any store–it’s a yard full of living, singing birds–all truly Duluth species. In what other American city can a person watch Evening Grosbeaks all year? Or see Cedar Waxwings all summer and Bohemian Waxwings all winter? Nowhere in the inland United States is there a fall hawk migration that compares with Duluth’s, or the combination of rare migrants and northern species that we get right here. We’re rich in natural resources that trite booster slogans can never begin to promote. If we wanted a really effective slogan to capture the essence of our city, we need look no further than the songs and calls of some of our own native birds.